Sydney Brown Releases Her Debut Single “Love Is Stronger Than Smoke And Fire” on Feb. 9th, 2018 to Benefit CA Fire Victims – WATCH VIDEO | TheUrbanMusicScene.com | The Youth Spot! San Francisco, CA – SYDNEY BROWN is a Pop singer/songwriter from San Francisco, CA, and together with Bay Area legend NARADA MICHAEL WALDEN wrote and recorded the single “LOVE IS STRONGER THAN SMOKE AND FIRE” as a benefit for the victims of the 2017 California fires. Presently 16 years old, Sydney began her singing career in 2009 and has performed in over ten Broadway musicals with different local theatre companies, including her favorites Legally Blonde, West Side Story, and Sweet Charity. Sydney met Narada in 2010 and began performing with him at his Spring Fling with Strings Concert, singing a cover of the Bill Withers classic “Lean on Me” for her first solo performance. SYDNEY BROWN began writing her own music in 2017, and is excited to release her debut single “LOVE IS STRONGER THAN SMOKE AND FIRE” on February 9, 2018. The song is co-written and produced by the iconic Grammy-winning producer NARADA MICHAEL WALDEN, who has also produced such legendary stars as Whitney Houston, Mariah Carey, Aretha Franklin, Sting, and George Michael. The single was recorded at the illustrious Tarpan Studios in San Rafael, California, and will be released in association with Walden’s Tarpan Records. When the devastating California fires broke out in October 2017, Sydney had already been recording with Narada. Horrified by what had happened to so many people in their area, they sat down to discuss lyrics and ideas, and the song “LOVE IS STRONGER THAN SMOKE AND FIRE” was born. Then Sydney had an idea: instead of creating this song for herself, she wanted to release the single in the interest of helping the fire victims that were so close to her. She teamed up with YouCaring and The Red Cross to ensure that proceeds from the single would go directly to both the Northern and Southern California fire victims. Within 48 hours of launching Sydney’s YouCaring fundraising campaign, her initial goal of $5,000 was met. Funds are still being raised. For more information on the fundraising project, please visit youcaring.com/sydneybrownmusic. The intense message of the lyrics and the situation has inspired the creation of a full-length music video for the song, with scenes in the video that include footage from the Sonoma, Napa, and Los Angeles fires and their aftermath. Shot exclusively in and around Sonoma County, the video will debut worldwide on February 16, 2018. The 2017 California fires have been devastating, and this cause has touched Sydney’s heart. Her goal is to touch the hearts of others and to ensure that all the fire victim’s lives are restored to the best of their ability. Like her father Willie Brown, former Mayor of San Francisco, Sydney believes in justice for everyone, no matter what. SYDNEY BROWN and Willie Brown will host a release event for “LOVE IS STRONGER THAN SMOKE AND FIRE” at the Golden Gate Yacht Club on February 10, 2018. Along with her love for music, Sydney has always had a desire to be a social justice warrior. She joined the Mock Trial team when she began high school in Marin County in 2015, sparking a passion for law which has since begun to flourish. Not only has she joined the Mock Trial team, but she has also been hired for an internship with a local criminal defense attorney. As being an advocate for social justice stole her heart, she wanted to combine her music with that passion. With the release of her new single in February 2018, that dream has become a reality. For more information about SYDNEY BROWN or future performances please visit Sydney’s website at www.sydneybrownmusic.com. 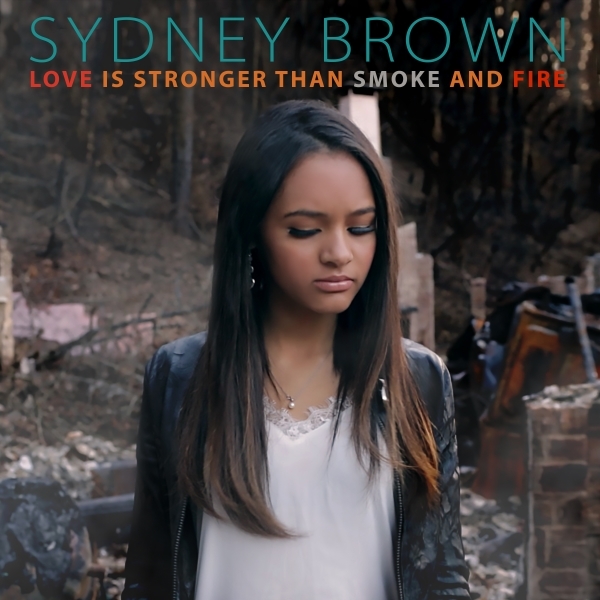 To Pre-order “LOVE IS STRONGER THAN SMOKE AND FIRE” on iTunes and Other Digital Retailers please visit http://smarturl.it/SydneyBrown.